Over 3,500 metric tonnes of munitions are kept at a military depot caught in a blaze after two gun rounds in the Kiev-controlled town of Svatove in eastern Ukraine, a local official said Thursday. KIEV (Sputnik) — According to Lugansk region governor Heorhiy Tuka, the fire at the depot in the Kiev-controlled city of Svatove started due to the flare gun rounds. According to Yuriy Klymenko, deputy head of the Lugansk Regional Military-Civil Administration, the fire at the depot started around 19:30 local time (17.30 GMT) followed by a series of explosions that continue to rock the town. "The depot stores over 3,500 tonnes of munitions. 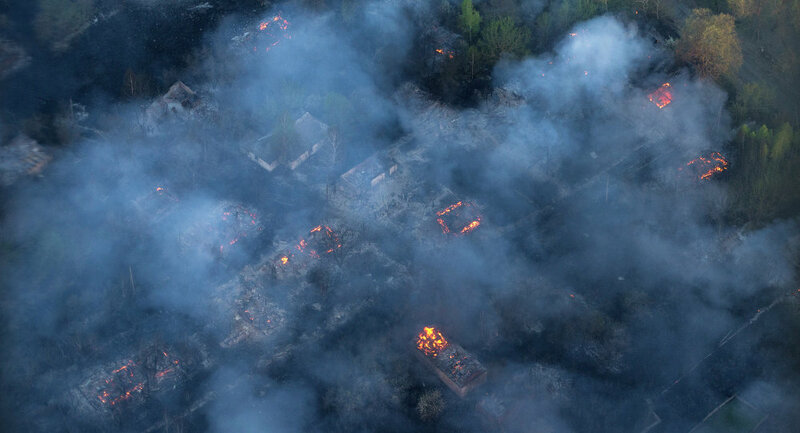 Explosions seriously complicate the efforts to put out the blaze," Klymenko said. According to media reports, the Ukrainian Security Service (SBU) has opened a criminal investigation into the incident on suspicion of "an act of terrorism." Lugansk region governor Heorhiy Tuka told the 112 Ukraina television channel, "two flare gun rounds were launched, the servicemen have put out the first round but while they were extinguishing the fire, the second [round was launched]." According to the Ukrainian Interior Ministry’s preliminary information, two people died as a result of the incident. The eastern Ukrainian region of Lugansk has been mired in fighting since 2014, when the Kiev-led government launched a military operation against the independence supporters in the region. The conflicting sides have signed a ceasefire agreement in February, and are pulling back their weapons.